We don't replace your countertop … we make it beautiful again! Grab the slider to see the transformation! Why Choose Refinishing over Replacement? Surface refinishing doesn’t require weeks of messy construction. In just 2-3 days, your kitchen and bathrooms will be beautiful again! Not only is surface refinishing fast, but you’ll save 50-75% over the cost of messy replacement. Our customers save thousands of dollars! We give you a high-end look without the high-end cost. We refinish your countertops, tubs, showers and tile in place making them look and feel like new! Refinishing performed with the right materials and using the right procedures produces incredibly beautiful results! But not all refinishing is the same. No other refinisher delivers the quality work or level of service consistently offered by Miracle Method. Miracle Method was founded in 1979 and we have proven our track record of superior performance and customer service with over 1.1 million satisfied customers. The combination of diligent preparation, our proprietary MM-4 bonding agent, advanced coatings and final detailing sets Miracle Method apart from all other refinishers. Be inspired by the transformations in our photo gallery, explore the services we have to offer and then contact us to change your surfaces from tired to inspired! Our estimates are always free, and we have more than 30 designer colors you can choose from. Our technicians are certified and have undergone thorough training. On each refinishing project, we take a detail-oriented approach to ensure quality, and our work comes backed by a warranty. Our surface refinishing services are a great alternative to remodeling, and we aim to beautify tubs, counters, and tile. Call Miracle Method of Corpus Christi to find out more details. Come visit our showroom on the South Side at Patton St. in Corpus Christi, TX. The Naro family and Miracle Method have been serving the Corpus Christi area as the premier surface refinisher for over 20 years. We have saved homeowners, hotels, hospitals and property managers thousands of dollars with our process of making dated and damaged bathtubs, shower pans, tile, sinks, kitchen countertops, and vanity tops look like new again. Our work has been featured in the Corpus Christi Caller Times and in HGTV magazine. We have not only done work in thousands of homes, hotels and apartments in south Texas, but also for Hilton, Marriott and other major hotels across the country. Visit our Corpus Christi showroom located at 5825 Patton, between Staples and Airline off Holly Road. See the difference refinishing can make and allow us to demonstrate how we can save you money over traditional removal and replacement remodeling. Our work is guaranteed. Need Surface Refinishing at Your Commercial Facility? We are North America’s largest commercial surface refinisher. We help in schools, hotels, hospitals, senior living, and military housing. 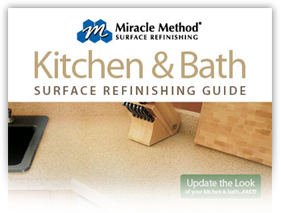 Flip through our online Surface Refinishing Guide!